Fremont, CA, May 28, 2013 - Exar Corporation (Nasdaq: EXAR), a leading supplier of high performance analog mixed-signal components and data management solutions, today expanded its family of low voltage, step down regulators with the addition of the XRP6670. 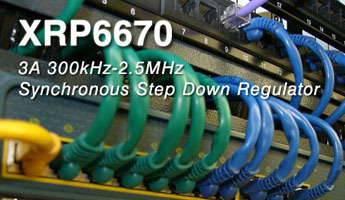 The programmable operating frequency of the XRP6670 offers power design engineers increased flexibility in optimizing component values, size and performance enabling precise management of electromagnetic interference (EMI) compliance and electromagnetic compatibility (EMC). Operating from a 2.6V to 5.5V input voltage range, the XRP6670 is capable of supplying up to 3Amps of continuous current with an adjustable output voltage as low as 0.8V. This synchronous Pulse Width Modulation (PWM) voltage regulator can accommodate a broad range of inductor and output capacitor values through its constant 300kHz to 2.5MHz programmable operating frequency. Additionally, the adjustable frequency range of the XRP6670, which is set via a single resistor, allows the user to optimize size, transient response and efficiency while precisely positioning the fundamental operating frequency and subsequent harmonics. Ideal for industrial, medical, and audio and video equipment, the XPR6670, with its compact form factor and reduced component count, is also ideal for space sensitive applications. "We continue to innovate with simpler to use yet higher performing and complete solutions," said James Lougheed, vice president of Power Management and AMS products, Exar. "The XRP6670 provides an unprecedented flexibility for any power architect looking to precisely control typical conversion design trade-offs between performance, size, cost and EMC/EMI compatibility." The XRP6670 is a synchronous current mode PWM step-down (buck) regulator capable of delivering up to 3 Amps of current. A 2.6V to 5.5V input voltage range allows for single supply operation from industry standard 3.3V and 5V power rails. Based on a current mode PWM control scheme, the XRP6670 operating frequency is programmable between 300kHz and 2.5MHz via an external resistor. It provides a low output voltage ripple, excellent line and load regulation and has a 100% duty cycle LDO mode. Output voltage is adjustable to as low as 0.8V with a better than 2% accuracy. Additionally, built-in over-temperature, over-current, short circuit and under-voltage lock-out protections insure safe operations under abnormal operating conditions. The XRP6670 is available now with pricing starting at $1.05 in 1,000 unit quantities. Samples and evaluation boards are available to customers for faster design and evaluation. The XRP6670 comes standard in a compact 3mm x 3mm, RoHS compliant, Halogen Free 10-Pin DFN Package. Additional information on the XRP6670 is available online. Additional information on Exar's power management products is also available online. Exar Corporation designs, develops and markets high performance, analog mixed-signal integrated circuits and advanced sub-system solutions for the Networking & Storage, Industrial & Embedded Systems, and Communications Infrastructure markets. Exar's product portfolio includes power management and connectivity components, communications products, and network security and storage optimization solutions. Exar has locations worldwide providing real-time customer support. For more information about Exar, visit https://www.exar.com.